Insurance for Plumbers | Utah | Four Seasons Insurance Agency, Inc. Liability insurance for plumbers protects you from the fallout of potential accidents and mishaps that can happen on the jobsite. 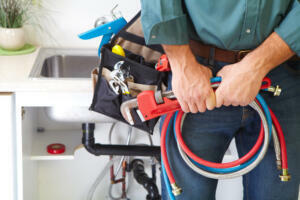 Plumbing contractors face a variety of risks every day. Without comprehensive liability coverage, you risk losing everything you’ve worked so hard to build. Unfortunately, the insurance market can be confusing and difficult to navigate. Four Seasons Insurance Agency, based in Sandy, Utah, assists plumbing contractors with general liability coverage and other business-related insurance needs. As an independent agency, we work for you, finding the best, most affordable coverages to fit your needs. In Utah, plumbing contractors must carry a minimum level of liability coverage to keep their license in good standing. Being an insured contractor provides potential customers with the peace of mind they need to trust you as their go-to plumber of choice. But, as critical as those factors are, liability coverage goes above and beyond to protect your business and preserve your interest. With each project you do, you run the risk of damaging someone’s property. You also risk having a third party get hurt on your jobsite, or as the result of something your crew was doing. One substantive lawsuit and you could lose everything. With a comprehensive liability policy in place, however, you can rest easy knowing that you’ll be protected in the event of the unthinkable. You could spend days on end, calling different insurance companies and getting price quotes for a plumbers liability policy. Then you could spend another week or two trying to compare coverages, premiums, deductibles and exclusions. Or you could work with an independent insurance agency who will handle all that on your behalf. An independent agent works for you and your company, rather than for one specific insurer. This provides a one-stop-shop for comparing a wide variety of policies, products and premiums. You also don’t have to become an expert in the commercial contractors insurance market. Your agent will explain everything in simple, easy-to-understand terms, allowing you to make informed decisions about your insurance coverage. Talk to the experienced team at Four Seasons Insurance Agency and you will quickly realize how much our services can benefit you and your business. We are locally owned and operated, with many decades of combined experience behind us. Our team is known for our exceptional customer service and our commitment to quality. We work every day with local businesses like yours, finding the right coverages and the right insurance providers to protect your interests and your future. We also conduct periodic reviews of your coverage, to ensure you always have the level of protection you need. Contact us today for a complimentary insurance review or to request a customized price quote for your plumbers liability policy.